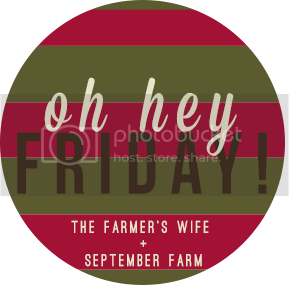 Mad Lib: Oh Hey, Friday! I haven't done a link up in forever and a day and this is a really great one so, why not? 2 // The Christmas festivities are in full swing! I am the type of girl that like to be on the move all the time. I complain about being so busy (a lot) but honestly I'd be bored out of my mind if I didn't always have something to do. Last night we went to a Christmas parade in the next town over and we all really enjoyed it. My best friend and her family were there and we stopped into a little pizza joint for really delicious and huge slices of pizza - a pretty great combo if you ask me. Tonight the square in our town is being transformed into Whoville and the Grinch himself will be there! Coopers going to flip but it'll still be good. Tomorrow morning we have our towns Christmas parade and actually get to ride on one of the floats for it! Next week we have Breakfast with Santa at church and then a fun White Elephant party. Basically we're looking at about two fun Christmas events each week leading up until Christmas itself! 3 // My mom has been calling me Matilda for years. I always have packages arriving several times a week. I love ordering stuff! Cooper has presents arriving left and right and I am beyond giddy about it. Almost everything is in unmarked cardboard boxes so I'm just leaving them out in our bedroom because he can't tell what anything is and our room is filling up quickly! Eric remarked last night that "wrapping all those presents is going to be so much fun" sarcastically but it really is going to be! I already have my bows, boxes, wrapping paper, and gift tags and so look forward to turning up the Christmas music and making some hot chocolate and then going to town on putting together and wrapping everything! 5 // I've been trying to think of and start doing more structured activities with Cooper (and Reid while we're working) and I've been surprised at home much direction and concentrating he is capable of. Today we used pom pons, buttons, and glue and I spelled out his initials (C N J) and had him completely fill the glue spots with the buttons and pom poms. He did so great and loved doing it! Now go link up too!